Souvenirs from places you’ll never visit. Searching and exploring through Behance’s discover page, we’ve stumbled upon this project featuring ordinary things created extraordinarily well. Impossible Magnets, is a series of circular magnets showing distinctive illustrations of fictional places from various media such as films, books, comics, video games, mythology, and cartoons. While all of these are creations of different imaginative minds, we cannot help but wonder over this fantastic illustrations. Each magnet in the series has a consistent, striking graphic design style. 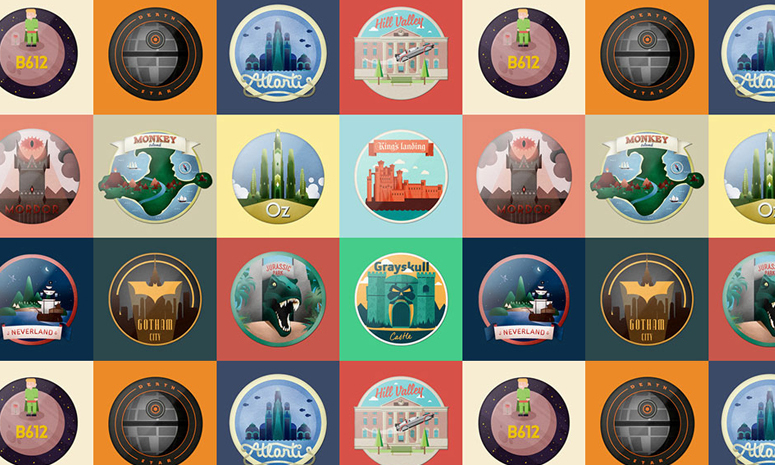 The project owners also created animated versions of each illustration in circular magnets that are equally beautiful! Pop culture geeks, feast your eyes! Impossible Magnets is a collaborative project of Martín Feijoó (idea & concept), Miguel Sousa & Sara Enriquez (illustrations & art direction), and Snack Studio (animations). You may also get your Impossible Magnets here. Were you as amazed as we were? Feel free to share with us your thoughts and opinions via the comments box below!